CORBA's 21st Annual Fat Tire Fest and Fundraiser is Sunday October 12th at Castaic Lake! Come Ride the Poker Ride in Hills by Castaic Lake October 12th at CORBA's 21st Annual Fat Tire Fest and Fundraiser! Beginner. 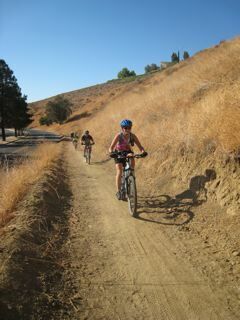 Mostly fire road, some pavement and double track with a few small hills. Approx. 3.5 miles. Beginner guided ride meets at the CORBA exhibit in the main staging area at 9 AM. Intermediate. 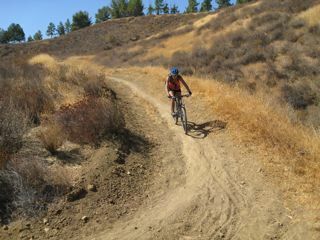 Several short steep climbs with some FUN technical single track. Approx. 9 miles. Advanced. Several short steep climbs, some FUN technical single track. Approx. 11 miles. Experts guided ride will meet at the Giant exhibit in the main staging area at 8:30 AM. Just five cards and you could be a big winner! Come out and ride! eat! and win! 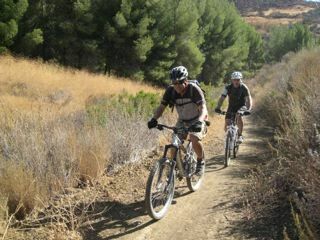 Support mountain bike trail access and enjoy a great day of fun on the trails by beautiful Castaic Lake. There is something for everyone! Register now to receive free raffle tickets and get your number plate in the mail. This year at the CORBA Fat Tire Fest we will have a Skills Area (see photo at left) for everyone to play and practice their bike handling skills! Hans could use some assistance with construction this coming Saturday Sept. 27th at Castaic. If you have time available to help please contact Hans at hans@otbmbc.com.